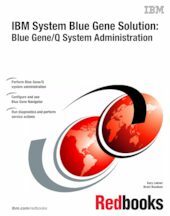 This IBM® Redbooks® publication is one in a series of books that are written specifically for the IBM System Blue Gene® supercomputer, Blue Gene/Q®, which is the third generation of massively parallel supercomputers from IBM in the Blue Gene series. This book provides an overview of the system administration environment for Blue Gene/Q. It is intended to help administrators understand the tools that are available to maintain this system. This book details Blue Gene Navigator, which has grown to be a full featured web-based system administration tool on Blue Gene/Q. The book also describes many of the day-to-day administrative functions, such as running diagnostics, performing service actions, and monitoring hardware. There are also sections that cover BGmaster and the Control System processes that it monitors. This book is intended for Blue Gene/Q system administrators. It helps them use the tools that are available to maintain the Blue Gene/Q system.